Executive Desktop Meditation Zen Garden 14.5" x 10.5" x 1.0"
Experience serenity as you transform sand and stones into a personal landscape of graceful simplicity while creating an ambiance of pure tranquility. Inspired by the world famous Zen Rock Garden at Ryoan-ji in Kyoto Japan, our executive desktop Zen garden calms the senses, clears the mind and melts away daily stress. 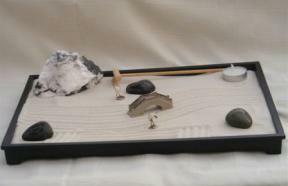 Our Zensational meditation Zen garden makes an impressive and memorable gift for family, friends and co-workers. Five tine Zen grooming rake, tea light candle, two ceramic crane birds 1.0" tall, ceramic bridge 1.75" all included.